Postcard from Naples 14 - I'm not sure if this is a postcard, either. Assuming it is, it's a nice one, printed from a hand-colored negative. From other sources we know that this song was published in 1892, so this is at least a reproduction of the original. In the illustration we see in the upper left corner the vertical note that this is a "Memento of Naples"; then, below the illustration the indication that this is a Canto Sorrentino, a Sorrentine Song. (That is not a genre such as the Neapolitan Song; it's just a song about a girl, Carmela whom the author happened to meet in Sorrento. 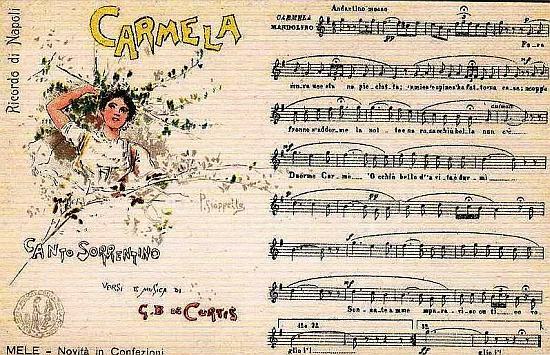 "Carmela" is, indeed, by song type, a "Neapolitan Song." The drawing appears to be by one P. Stoppella (nothing there, sorry). I'm confused by the text at the bottom, Mele - Novità in Confezioni. There's something about it that makes me think this is not a postcard but an advertisement. At least Carmela was written for a pretty girl. According to G.B. He met Carmela in a hotel lobby He asked her what she did and she said "sleep." Inspired, G.B. penned the dialect lines, Duorme Carmè: ‘o cchiù bello d’ ’a vita è ‘o ddurmì… [Sleep, Carmela. That is the most beautiful thing in life].